Everything is connected… “Living the Dream” (Los Angeles, CA – Nov. 2018). …IF – you REALLY want to create a culture of sustainable excellence – empower people around you – committed people – who want to genuinely grow your business, improve quality and contribute to increased market share – that is, attain “REAL” and enterprise-wide “Buy-in…” Here’s one way to begin. Ask yourself, “What impression do I want to make? Is my audience capturing the intended message? Am I motivating people through inspiration, strategic business logic and a purposeful vision – such that your audience see’s, feel’s and “believes” in the results? If so, you’re on the right track. If not, I’ll explain as we move along, how to build and define the “Why?” behind your sense of purpose. The definition begins with a metaphorical example I used in my response to share the power of vision in a substantive and scientific manner. It’s a story. If you want to achieve organizational “buy-in” – let me share a study conducted in 1952 on the remote Japanese island of Kojima. It’s known as, The 100th Monkey Effect. Its science is founded on empirical research and evidence regarding the physics of conscious energy. The 100th Monkey Theory is about activating Collective Consciousness – Critical Mass. It’s a phenomenon by which new behavior and ideas are adopted (spread), once a critical number (mass), is achieved. Then, other groups (i.e., organizational departments, divisions and Business Units), follow suit. In short, when “X” number of people see, feel and believe the same thing – there is a mental fusion – a mental explosion of like minds that “embrace” the same thought – the same awareness – ergo, organizational “Buy-In” (remember, “Ideas are caught, not taught?). This, in my opinion, cracks the code to positive influence, business success and moves mountains. Here, is the perfect time to process how this concept can truly transform and differentiate you as a leader if you achieve positive “Critical Mass” when delivering your message. Too much trouble to attain? Are your business and growth goals on track? How effectively do you influence others? How close are you to organizational “Buy-in?” Now, we know why some plans, strategies and margins fall short. You see, when you think about it… (Please look for Part III – Nov. 25, 2018). In continuation of our organizational “Buy-in” theme…if there is a panacea – a cure-all – to getting people to see and believe in your picture…a blue pill that cracks the code to successfully mirroring Conscious Leadership principles and achieving this elusive state of “Buy-in…” What’s one of the first steps in realizing this quintessential spirit behind all the business objectives, questions, anecdotes and assumptions alluded to in, “Living the Dream?” (Nov.10 (https://syntesisglobal.com/blog/). They require another crucial foundational piece: AUTHENTICITY. As a “Conscious Leader,” (one who considers business, systems & people-not just the metrics), you must define from within to what you aspire (self-awareness). This is critical (remember: don’t intellectualize this, or you’ll miss the point?). In consideration of a person who wants to lead others with “Buy-In” – I further responded. 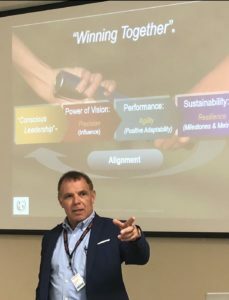 IF – you REALLY want to create a culture of sustainable excellence – empower people around you – committed people – who want to genuinely grow your business, improve quality and contribute to increased market share – that is, attain “REAL” and enterprise-wide “Buy-in…” Here’s one way to begin. Ask yourself, “What impression do I want to make? Is my audience capturing the intended message? Am I motivating people through inspiration, strategic business logic and a purposeful vision – such that your audience see’s, feel’s and “believes” in the results? If so, you’re on the right track. If not, I’ll explain as we move along, how to build and define the “Why?” behind your sense of purpose. The definition begins with a metaphorical example I used in my response to share the power of vision in a substantive and scientific manner. It’s a story. If you want to achieve organizational “buy-in” – let me share a study conducted in 1952 on the remote Japanese island of Kojima. It’s known as, The 100th Monkey Effect. Its science is founded on empirical research and evidence regarding the physics of conscious energy. The 100th Monkey Theory is about activating Collective Consciousness – Critical Mass. It’s a phenomenon by which new behavior and ideas are adopted (spread), once a critical number (mass), is achieved. Then, other groups (i.e., organizational departments, divisions and Business Units), follow suit. In short, when “X” number of people see, feel and believe the same thing – there is a mental fusion – a mental explosion of like minds that “embrace” the same thought – the same awareness – ergo, organizational “Buy-In” (remember, “Ideas are caught, not taught?). This, in my opinion, cracks the code to positive influence, business success and moves mountains. Here, is the perfect time to process how this concept can truly transform and differentiate you as a leader if you achieve positive “Critical Mass” when delivering your message. Too much trouble to attain? Are your business and growth goals on track? How effectively do you influence others? How close are you to organizational “Buy-in?” Now, we know why some plans, strategies and margins fall short.